Some shows stand the test of time perfectly, and arrive in the modern day as ageless, critically-acclaimed classics that are watched again and again. Others fade away just as quickly as they sparked dully into existence. Bubblegum Crisis, the 1987 8-part OAV series that stormed the small American anime market in the early '90s, isn't really either one. The series' vision of a futuristic "Mega Tokyo," crushed under the weight of its own sprawling mass, feels like a low-budget animated Blade Runner, complete with a special police force (the AD Police) that exists only to track down and destroy renegade worker robots called Boomers. 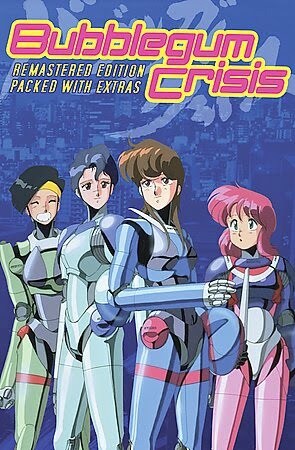 The divergence from Blade Runner's iconic setting comes in the form of the Knight Sabers, a half-vigilante, half-mercenary squad of four women who typically take Boomer-related jobs from the highest bidder, donning robotic "hardsuits" and doing battle by night while holding inconspicuous day jobs like "lingerie shop owner" or "cyberpunk Hannah Montana." 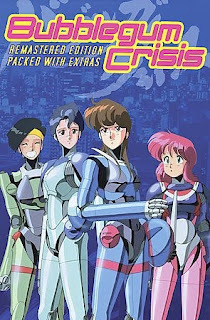 The first four episodes of Bubblegum Crisis are little more than character building exercises for the Knight Sabers (Priss, Sylia, Linna, and Nene), featuring a variety of adversaries for the fearless foursome to take down. For example, one features a team of Boomer kidnappers masquerading as humans, while another one revolves around a murderous driver seeking revenge against one of Mega Tokyo's local motorcycle gangs. Arguably, the show has a consistent conflict between the Knight Sabers and the evil Genom corporation, but the screenwriters’ attempts at cohesion are weak at best. Meanwhile, the main plot in each episode is usually relatively predictable, with its pulpy, film noir-esque mystery framework, but that's not really the important part. What is important? The sweet robot-on-robot action of course! The scenes in between the fights often consist of low-framerate animation or static images, but when the girls get into their hardsuits (created by influential '80s character designer Kenichi Sonoda*), the metal shines, the lasers fly, and the AD Police helicopters start exploding. What I keep trying to figure out is why I love this show so damn much, even though it's just so damn bad. Even in the later episodes, when the animation takes a significant turn for the better, the episodic plots retain their maddening predictability. One of the Knight Sabers meets and befriends another woman who happens to be tied into some sort of evil Genom plot. Then someone hires them for a job and their new friend is brought into the fray. Rinse and repeat. There's something special about Bubblegum Crisis, though. If nothing else, the Knight Sabers themselves are memorable, with Priss the hotheaded motorcyclist and indie rock musician, Sylia the lingerie shop owner and leader of the Sabers, Linna the boy-obsessed gymnast, and Nene the incompetent AD Police officer and hacker. Their expressive, distinctive character designs by Kenichi Sonoda (Gunsmith Cats, Riding Bean) bring the four to life, and their clashing personalities make for some genuinely funny moments of conflict between the girls. And then there are the robot fights. Nearly every one is filled with classic action-movie "Oh Snap!" moments, as robots (and people) are ground under motorcycle wheels, blasted with machine gun fire, and punched with EXPLODING PUNCHES. Priss even uses a rocket-powered kick in episode 6! Of course, since each episode is its own self-contained story, directed, animated, and written by a partially new staff every time, the show frequently see-saws in terms of quality. Nevertheless, the two episodes that really stood out to me are episodes 6 ("Red Eyes") and 8 ("Scoop Chase"). The former, directed by Masami Ōbari (Gravion), features a sexoroid, a guy with control over an orbital laser, and the previously mentioned rocket-kick. The latter, directed by Hiroaki Gohda (Ah! My Goddess), is what I like to call "Nene's Aquaman episode," since it's clearly tailor-made to create a situation where Nene can contribute in a meaningful way to the Knight Sabers for once. Despite clearly being made for her, the episode still fleshes out her personality in a way that no other episode does, making Nene (to my great surprise) the most well-developed character in the show! As far as I'm concerned, this is a show that, for all rights and purposes, nobody should like. It is simple-minded, trashy late-'80s pulp entertainment, created as a way to cash in on the cyberpunk boom that directly followed Blade Runner, but somehow, some way, I was — completely un-ironically — entertained by it. So we're back to the big question: why do I love Bubblegum Crisis so much? After putting quite a lot of thought into it, I realized that the answer is really quite simple: It's fun. No symbolism, no emotion, no deeper meaning. Just good old-fashioned robot-smashing fun. This review is based on a copy of the AnimEigo "Remastered Edition" DVD box set release of the series, borrowed from the Rensselaer Sci-Fi Assn. anime library.